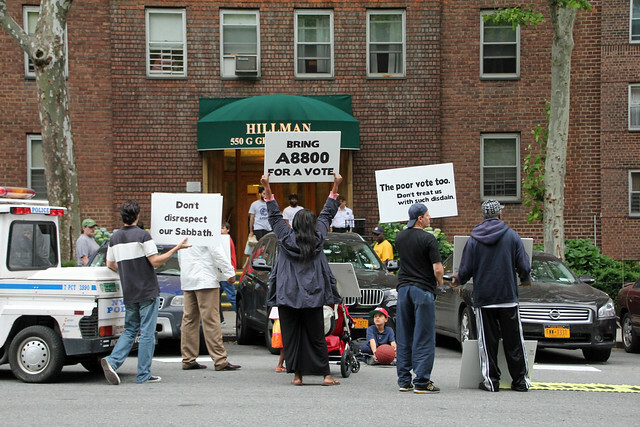 A small group of protesters took their school worship ban fight to the home of New York Assembly Speaker Sheldon Silver. Two New York City pastors took their ongoing protest of the city’s ban on worship in public schools to the home of New York State Assembly Speaker Sheldon Silver on the eve of the Jewish Sabbath last night. They charged that the Jewish lawmaker has disrespected their “Sabbath” by failing to bring a bill to the House floor that would permanently restore public school access to affected houses of worship. A similar bill has already passed the New York Senate and supporters say there are enough votes in the House for Bill #A8800 to pass in the House. More than 60 churches won a temporary reprieve in February when U.S. Chief District Judge Loretta A. Preska issued an injunction against the city’s Board of Education, but a city attorney has said the city will appeal if Preska rules permanently in their favor. The Rev. Rick Del Rio, senior pastor of Abounding Grace Ministries, organized the Sabbath eve demonstration and lives four blocks from Silver. He has ministered in their Lower East Side neighborhood for two decades. Members of Rev. Del Rio’s church spoke to UrbanFaith about the school worship ban, saying it represents a threat to their religious freedom. They were joined by the Rev. Dimas Salaberrios, pastor of Infinity Church in the Bronx. Salaberrios said the worship ban inordinately affects economically disadvantaged communities and accused Silver of lying and double-dealing in regard to the bill. A Security guard at Silver’s building barred UrbanFaith from ringing his buzzer for a response to the demonstration, saying Silver was not at home. Del Rio said the Speaker knew about the protest in advance. He promised to return next week with a larger group if Silver fails to act. The current legislative session ends June 21. *Note: For more of our exclusive reporting on this story, see the links below. For more video and photos from the protest, go to Explorations Media’s Flickr and YouTube channels. abounding grace is a wonderful church i see no reason why we shouldnt be allowed to congragate in a school. The lower east side NEEDS abounding grace , they need love and words of encouragement and last but not least the lower east side needs GOD and abounding grace provides all those things ! abounding grace and other churches should be allowed to congragate in schools !